To find more information as it becomes available, and for details of how to contact the center and register for these events, please go to Rinpoche’s Schedule. We have recently updated this webpage to be even easier for you to use! harming others. No way. There’s no way to live life without others receiving harm, without being killed, without others suffering, there’s no way you can survive even one day, you can’t survive even for one day. So, this is how life is in samsara. That’s why we need to be liberated: the answer, the ultimate answer is to get liberated, to get out of samsara. As I normally say, whenever work is done in the field for this one grain of rice, so many beings got killed and received harm and somebody created negative karma, harming them. So now, this one rice came from another rice, then so many sentient beings suffered for that, died, killed, got killed … it goes on and on like that back to the very beginning of the continuity of rice when it started in this world. So there’s no way to eat this rice without some serious careful, meaningful thinking, without at least something benefiting to the numberless sentient beings who died for each of these rice grains. Especially, the really hardest, most difficult thing to do, the most painful thing, is to eat with this – only thinking about my happiness, completely ignoring all those numberless sentient beings who died, suffered, and killed, creating the negative karma for all this rice. So therefore you can see now, the emergency of practicing Dharma becomes the most important thing in the life – more than anything else, achieving liberation from samsara for your sake and for the sake of sentient beings, for them to not suffer, not get killed – that’s the main answer. 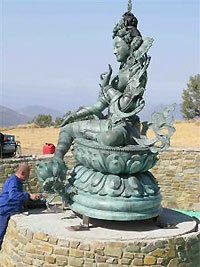 The greatest purpose, benefit, is to achieve enlightenment for sentient beings. In everyday life, this is the most important thing to achieve: enlightenment for sentient beings, to liberate numberless sentient beings from oceans of samsaric suffering and bring them to enlightenment – wow! We have met all these teachings this time, so that shows how we are the most fortunate persons in the world. But this incredible opportunity, this wish-fulfilling, perfect human rebirth where we have met all this Dharma, sutra and tantra, can be stopped anytime. So, therefore, really to learn, practice, and actualize the path is more important than anything else in life, the most important. Teachings, May 1, 2009, Institut Vajra Yogini, France. Transcribed by Ven. Thubten Munsel and edited by Claire Isitt. Futher edited by Doris Low for FPMT News August 2009. Over the course of one month, friends and students from around the world recited 3.3 million Mitrukpa mantras and contributed almost US$10,000 towards a Nagarjuna statue with the dedication to overcoming obstacles for our precious Guru, and for his good health. Above and beyond that, many students made tsa-tsas of the Buddha, and one senior disciple pledged to recite one mala of the mantra every day for the rest of his life, with Rinpoche’s well-being as the goal. Whose heart is filled with peace and great joy, bliss by having generated loving kindness and devotion, Billion, zillion, million, thanks for having recited Mitukpa mantra more than seven hundred thousand it is unbelievable. Now maybe recite some Tara Praises for success of wishes that so all the projects, especially the project of Maitreya Buddha, the Organization , could liberate all sentient beings as quickly as possible from ocean of suffering of samsara and enlighten them quickly. 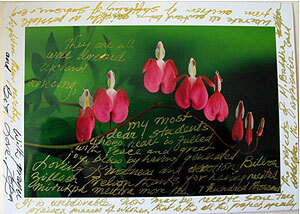 “I am very thankful to you for your letters which update me about the different Dharma centers around the world. I’m glad to hear about the Mitrukpa mantras being successful. Although I am not a participant of this, I am very glad to know about it. I often offer puja and prayers, and hang different prayer flags with powerful mantras. Last time, I successfully finished the 100,000 Tara mantras at Kopan Nunnery and Monastery for Lama Zopa Rinpoche’s good health, the success of all projects around the world and for overcoming all the all obstacles of all Dharma centers around the world. In May at Lawudo, I successfully organized the tree-planting program 14,000 ft high above sea level for the success of the Maitreya Project, for the good health of His Holiness the Dalai Lama, for the good health of Lama Zopa Rinpoche and the success of all projects and Dharma centers. This August, I am going to Lawudo to hang 1 million prayer flags on the top of the mountains behind Lawudo Gompa with different powerful mantras (Kurukulla mantras, Tsela Namsum and Guru Farchey Lamsel mantras.) Moreover, I pray daily in the mornings especially for His Holiness the Dalai Lama and Lama Zopa Rinpoche’s good health, the success of all FPMT Dharma centers around the world and success for all project within FPMT around the world. 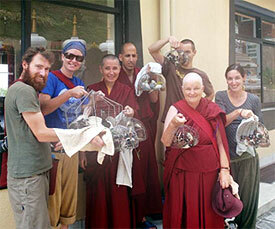 In June 2009, FPMT sent US$134,182.60 to Sera Je Monastery. This contribution covers six months’ worth of meals (we are now able to offer three meals a day) for all 2,600 monks currently studying at Sera Je. The Sera Je Food Fund is one of FPMT’s most important projects. Sera Je is the monastery where most of our teachers and their teachers come from. The nourishing meals help the monks stay well enough to study and practice over full days and long years, ensuring that the Dharma will be maintained for future generations all over the world. This is the eighteenth year that we have been offering food to the monks at Sera Je Monastery. To date the Sera Je Food Fund has provided over 10,000,000 meals. That’s 2,500,000 meals per year, 7,800 meals every day. Please rejoice in this incredible effort! Many thanks to all the kind benefactors who enable us to make these offerings! We would like to thank especially Cham Tse Ling, Amitabha Buddhist Centre and Yeshe Norbu – Apello per il Tibet for their continued generous support. Access to the Student Discussion Forum and the Ask an Elder Forum for the opportunity to converse with your fellow participants and to receive guidance and answers from the Discovering Buddhism elders for any unresolved questions. You can create an account at Online Learning Center. The enrollment key for this module is calmabiding07. Modules 1, 10 and 12 are also available online and can be purchased either on the Foundation Store or as a benefit of Foundation Membership. Betty Molloy of California is our first participant of Discovering Buddhism at Home to receive a completion certificate signed by Rinpoche. Betty is in her 80s, was caring for her husband with Alzheimer’s during her studies and completed all of her Module 14 requirements! Wow! “Of course, continuing study and reflection on the lam-rim is essential. This is the core of our practice, this is the real path to enlightenment. Reading, reflecting and meditating on lam-rim daily is what will carry us through life with our hearts and minds pointed in the right direction. It is no mistake that the first practice given to us by our precious teachers, Lama Thubten Yeshe and Lama Thubten Zopa Rinpoche, is the lam-rim. 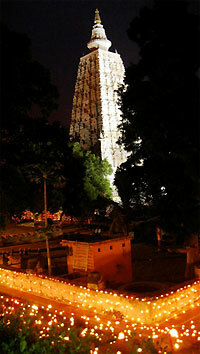 It is the heart of Discovering Buddhism and must form the core of our continuing Dharma practice. Basic Program: Completion cards are now available in English, French, Italian, Spanish and Czech. Please note that many updates have been posted since CPMT in English, French, and Spanish. Please have a look! Light the Path: Register now! Retreat begins September 8. The entire retreat will also be available as a webcast on Light of the Path’s homepage. Attention Sangha: funding from two generous benefactors has brought the registration cost down to $300. Simply note you are a Sangha member when you register. Translation will be available in Spanish, Italian and Chinese. From Merry Colony: Also a note for all centers, we now have available the Heart Advice for Death and Dying program for centers, which contains a very detailed outline (with guided meditations) on how to teach this five session course. 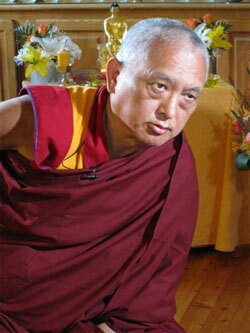 The program also includes the book by the same name that Rinpoche is recommending above. Elea Redel passes the torch to Ven. Détchèn of Kalachakra Center, Paris for heading up the French Translation Office. With grateful thanks always to Elea for her amazing and inspiring service and thanks to Détchèn for taking on this important position. Chenrezing Institute: “Wheel Turning Day and International Sangha Day were yesterday and we were further blessed to have Geshe Tashi Tsering (Kuzho Lama Lozang Rigdzin) join us to ordain two new monks and three new nuns and to bestow the bodhisattva vows. The center offered lunch and robes (woollen zens) to 35 Sangha on behalf of the members, students, volunteers and staff of CI. Around 135 people attended the bodhisattva vows on Saturday and teachings on Sunday on generating the mind of enlightenment”. “Our water bowls retreat culminated on the bright, sunny day of Saka Dawa – with community members joining retreaters to offer saffron water and flowers at Lama Yeshe’s holy stupa. Afterwards, retreaters participated in a Dorje Khadro purification practice at our new fire puja site. … For this retreat, bowls of water were filled with the motivation to attain enlightenment for the benefit of all sentient beings. This energy, created with such pure motivation, will surely lead to happiness. We rejoice in the great fortune of those who were able to participate this year”. Rinpoche’s short ten-day visit was quite busy in Rinpoche’s usual way. Arriving in Kopan at 2:00 pm on the June 12, Rinpoche still had time to make some of the afternoon session of the first day of special prayers at the small gompa facing onto the famous Bouddhanath stupa. 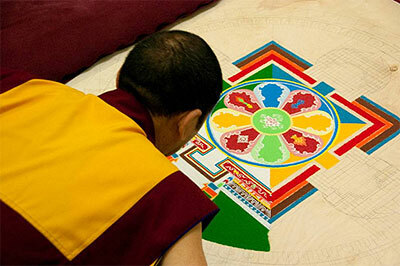 These five-and-a-half days of prayers are now an annual occurrence, now in the third year and dedicated to sustaining and spreading the Dharma in our world, and for Tibet, etc., in accordance with the advice of His Holiness the Dalai Lama. From 7:00 am to 5:00 pm daily, Rinpoche was joined by Dagri Rinpoche, Khandro-ma, Khenrinpoche Lama Lhundrup, one ngagpa lama amongst others, and many of the Kopan monks and nuns. At the conclusion of each day, Rinpoche would immediately do circumambulation of the Bouddha Stupa, and was always joined by Khenrinpoche, sometimes Khandro-ma, and always Western students and some groups of local people, whom Rinpoche would invite to meet him again the following day. Prostrations sometimes followed korwa, sometimes a teaching on the stupa or how to offer the sound of the bells at the stupa or how to offer rice as wish-granting jewels. One afternoon, Rinpoche led the taking of bodhisattva vows from the stupa complete with orchid offerings. After the conclusion of prayers on June 17, Rinpoche cordially opened the new school building at Kopan, where tea and snacks were followed by a tour of the building, some speeches, an inspiring motivational teaching by Rinpoche that went through the dinner hour and into the night and concluded with thank-you offerings to sponsors and workers alike. Everyone felt well established in the new location by the evening’s end! The next morning, Dagri Rinpoche and Kandro-ma offered a special long-life puja to Lama Zopa (sung-dok, roughly translated as “Countering That Which is Not Harmonious) as they had offered in previous years. Several days later, this same long life puja was offered to Khenrinpoche in Kopan’s Lama Gyupa gompa. Both pujas were attended by Kopan geshes, senior monks and nuns and guests. On the tsog day evening Rinpoche, together with Dagri Rinpoche, Khandro-ma and Khenrinpoche and some students, offered tsog at Chowa Gompa in Bouddha. This small gompa is relocated from Tibet where it was founded by Rechungpa at the place of Milarepa’s passing. The small gompa has several relics of Milarepa, most notably a statue of Milarepa made by Rechungpa containing nose blood and cremation ashes. Between pujas, an evening of fire pujas was also conducted on Kopan Gompa’s roof, adding to the already auspicious time. As usual, the remainder of Rinpoche’s time was packed with appointments, interviews, dinner parties and the like, not wasting a moment. Even after Rinpoche’s departure, we received telephone advice to buy all the birds being sold just outside the Kopan gate, which Rinpoche had seen on leaving. Rinpoche asked all the Western students circumambulate them many times around Kopan’s ten stupas with many, many mantras recited out loud! An encouragement for us not to waste the moments! May we be blessed by many, continual auspicious visits in all our futures! Many interesting and challenging positions on a paid and volunteer basis are inviting applications from suitable candidates. In Australia, Chenrezig Institute and Tara Institute are both looking for Spiritual Program Coordinators, while FPMT Australia needs a Policy Writer to help formulate policies for the national office and/or local centers and activities. With apologies, Marly Ferreira did not resign as the coordinator as previously reported. Congratulations – Study Group Becoming a Center!